Marketing challenges > Oops, my bad! How to bounce back after a mistake. You’ve put in all the hard work: built your latest email campaign beautifully and followed all the best practices guides, step-by-step. You’re ready to go, but don’t want to hit that send button. I’ve actually had clients ask me to send their campaigns for them, just so they have someone to share the blame with if it all goes wrong (I politely refused). Sometimes things do go wrong. Despite your best efforts, and the voice in your head (usually your account manager) reminding you to QA test, test and test again, we can make some unavoidable email marketing clangers. We all make mistakes; it’s what we do once we’ve noticed the mistake that makes or breaks us. If we act quickly, we can often make blunders work in our favor. This is the benefit of working with email: things can be resolved relatively quickly – as long as we know what to do when disaster strikes! First off, you will need to find out if the send has completed or not. Emails get sent extremely quickly, so we’ll need to be quicker to catch them before they go. dotmailer allows you to pause or even cancel a campaign if required. If the email’s already out there, and the issue is link related, you have a few options available to you. Typically, the URL, webpage or landing pages themselves can be edited even after your email has been sent, and all three are easily amended in dotmailer. Check out some details on how to do this. 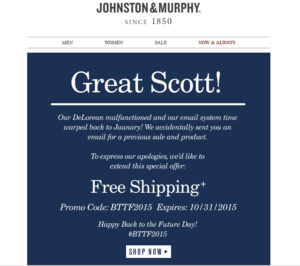 An offer code and product from much earlier on in the year was sent out mistakenly, but they covered it expertly with some humor and a unique promo code making reference to Back to the Future. The pre-header text is often over looked, but can be very useful. For Benefit’s blunder, it doubles up as a secondary subject line. These examples are great to have – more can be found on sites like Fresh Address – but if you’re anything like me you’ll want to make sure you limit the potential for mistakes in the first place. You can help avoid mass blunders by throttling your campaign, sending to small groups of subscribers over a number of hours. This is another useful tool within dotmailer and as always is really simple to setup. Plus, this dotmailer checklist is great for giving you peace of mind before you hit send. To err is human. But humans are also great at making the best of a bad situation. As long as you catch your mistakes early, and are willing to own up to them, you can turn them into an opportunity to let your brand personality shine through.